Digital photography employs a camera just like film photography, but instead of capturing the images to film, digital media stores the photos for retrieval with a computer or for display on a television set. Some digital cameras can be connected directly to a printer device negating the need to view photos on screen. Some printers and computers accept memory cards from your digital camera so the pics can be printed or viewed without needing to attach the camera. Here, we provide a few pointers on what to expect from digital cameras, photos, and why you should be interested. 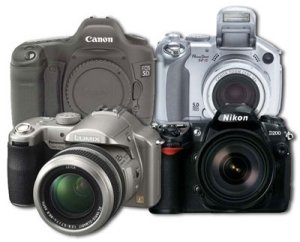 Digital cameras (digicams and SLRs) are available for a hundred dollars up to many thousands of dollars. For most people, the cameras that are below US$1000 are the only ones to consider. At the present time, there is little to gain by spending more than that unless you're a real professional. Shopping for digicams can be a daunting task. Many have very similar features. Some have manual exposure controls allowing more creative flexibility. Most pocket-size cameras shoot movies... in varying file formats and resolutions. Some have optical viewfinders, while others have only the LCD screen on the back for composing your shots. Many have optical or digital image stabilization. Look for optical stabilization if you have shaky hands or like to zoom in a lot. Cameras vary in image resolution, typically measured in megapixels (five to seven megapixels seems to be the sweet spot for quality output). To help increase your knowledge before purchase, we recommend visiting camera review websites, comparing features and prices, and looking at sample camera output. Digital Camera HQ is a highly effective resource for helping to choose the equipment that's right for you. Most digicams save images to a flash memory card and use compression to maximize the number of photos that can be stored on these cards. Consider how many photos can be stored without switching cards, whether it is enough, and whether you can afford additional memory cards. If you are planning a long vacation and don't expect to have access to a computer, this becomes an issue. Will you be able to take all the pictures you want without running out of memory? We don’t pretend to be experts on all the cameras available, so shop around and compare features. For instance, you may want a zoom lens but not care how the camera goes about storing images. We highly recommend buying a camera that has an optical viewfinder. It’s very cool composing your photos with the LCD screen on the back of the camera... until the batteries go dead on you, or you're out in bright sunshine and can't even see the screen. Digital cameras use batteries like speed boats use gasoline. With an optical viewfinder you can extend the battery life by turning off the LCD. Always have spare batteries, just in case. Digital cameras consume batteries so fast you should consider getting rechargeables. Now you have your new camera and are ready to shoot up the world, so to speak. Most digicams have at least two resolution settings usually called normal resolution and high resolution. We think these should be referred to as poor resolution and better resolution. Usually you will want to shoot at the highest resolution possible! You don't want to be looking at your photos 20 years from now wishing that you had 10 good shots instead of 40 lousy ones. It does make a difference. Use the optical viewfinder to compose your photos, not the LCD. This will extend the life of your batteries considerably, enabling you to photograph that fantastic sunset you weren't expecting earlier in the day. Exceptions to this are when you are taking an extreme close-up of say, flowers, when you want to be sure they are in focus, or when you're taking a photo of your eight children and 17 grand children and you want to be sure everyone is in the picture. Always have spare batteries, just in case. Digital cameras consume batteries so fast you should consider getting rechargeables. (Rechargeable nickel metal hydride batteries and chargers will save you tons of money in the long run.) If you have an AC adapter for your camera, use it when downloading your photos to your computer or displaying them on your TV. Most digicams, unlike film cameras suffer a momentary delay from the time you push the button until the photo is captured, and an even longer delay until you can take the next photo due to the memory write process. Keep this in mind if the action is fast and furious. You don't want to miss anything, so be prepared. Some digicams have a buffer that allows you to shoot several pictures in rapid succession. Consider this if you are into action photography like skiing or car racing. You may want to keep that old film camera for backup. There can be drawbacks to current consumer digicams. However, we find that the instant gratification of not having to wait for the film processor to finish your photos, and the savings of not having to pay that film processor, make digital photography very inviting. Look for it to continue getting even better. We hope you found this tip helpful in consideration of your digital photography interest level. 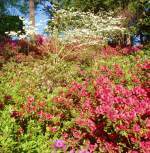 You may share your thoughts with the email link at the bottom of this page. 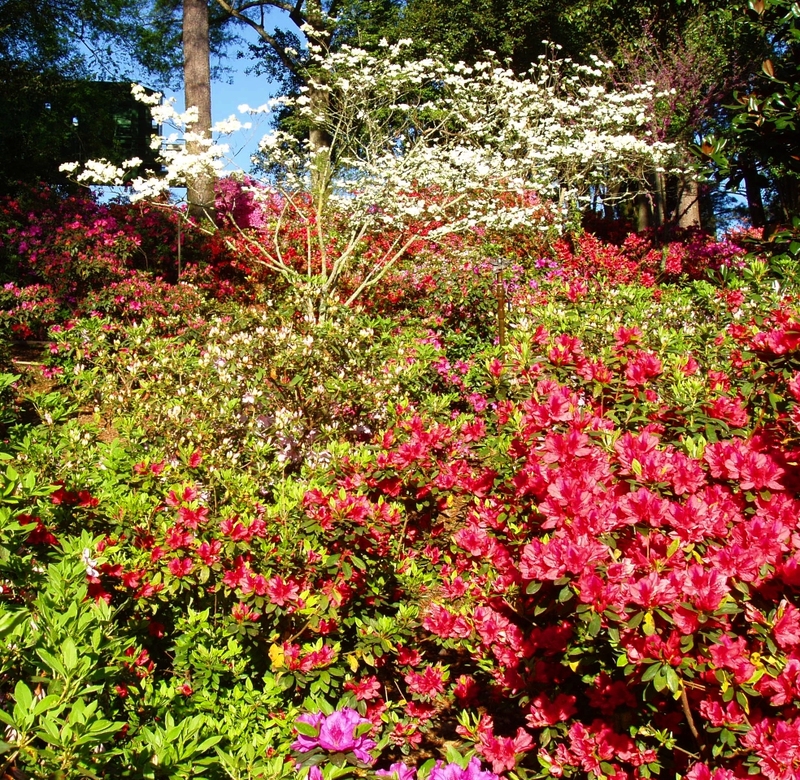 Just for fun, click on the image above to see the full size photograph from Augusta National Golf Club, home of The Masters.